In our current culture, experience does not appear to be held in as high regard as perhaps it should. Fortunes have been made by people with little or no experience. A whole slew of technology entrepreneurs come to mind. However, by definition, no one has experience in innovative technologies that have never been commercialized before so their success is not dispositive. Our current president had plenty of experience running a real estate development company but none in government at any level. Across the political spectrum one of the new stars of the democrat party, Alexandria Ocasio-Cortez, who was a 29-year-old bartender before being elected to Congress, does not appear to have much experience that would qualify her to set government policy. Last week I watched a film about an extraordinary achievement. It recently won the Oscar for the year's best documentary. It was called “Free Solo” and followed the mountain climber Alex Honnold as he prepared for and succeeded in the seemingly impossible feat of climbing Yosemite’s El Capitan, shown below, without a rope or any other safety gear. It is a captivating and breathtaking movie. Alex Honnold could attempt and succeed in this seemingly suicidal undertaking because he has experience. He had done dozens of free climbs on some of the world’s most challenging cliffs and had experience knowing how to prepare for them. He drew on the experience of the many climbers who had climbed El Capitan, albeit with ropes, before. He studied their routes and picked the best one. Then he practiced each section over and over along with a trusted experienced team member upon whom he could draw for advice and feedback. He kept a journal and memorized every single hand and foot placement he was going to make on the 3,000 foot ascent. So, his climb was not a kamikaze mission, it was a painstakingly choreographed and practiced endeavor. He had the experience and the skill to be successful. Failure was not likely although, as he himself acknowledged, death would result if it occurred. Free soloists who fail do not gain experience, they die. The same should not not true for corporate managers. As Walter Wriston understood, mistakes can teach. However, when one finds a management team that has been successful at navigating a difficult situation, chances are they have the requisite experience needed to do it again. Which brings us to the Hain Celestial Group Inc. (HAIN). Hain is a company that manufactures and sells many well-known healthy, organic and specialty food and personal product brands. These include Celestial Seasoning Teas, Hain Pure Foods, Terra Chips, Avalon Organics personal care products and many others. Things have not been going well recently for HAIN. How poorly? In the past five years, the stock has underperformed the S&P 500 Food Products index by nearly 61%. Revenue stopped growing in 2016 after profitability peaked two years earlier so, to us, the stock price underperformance is no surprise. So, what did the owners of the company do? They looked for an experienced management team to come in and right the ship. Preferably a team that had experience in a similar turn around in the past. This lead to the hiring of Mark Schiller as the new CEO in October of 2018. 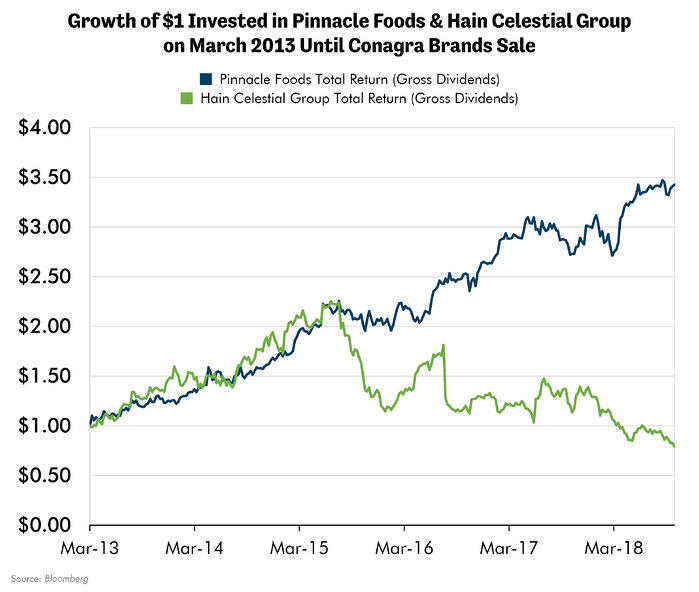 Mark had been a senior executive at New Jersey based Pinnacle Foods (PF) from 2011 almost until its sale to Conagra Brands in October of 2018. Like Alex Honnold after determining to free climb El Capitan, Schiller quickly assembled a team to help him. Among the chosen were a few of the senior executives with whom he had worked with at PF and with whom he had experience turning around underperforming brands. 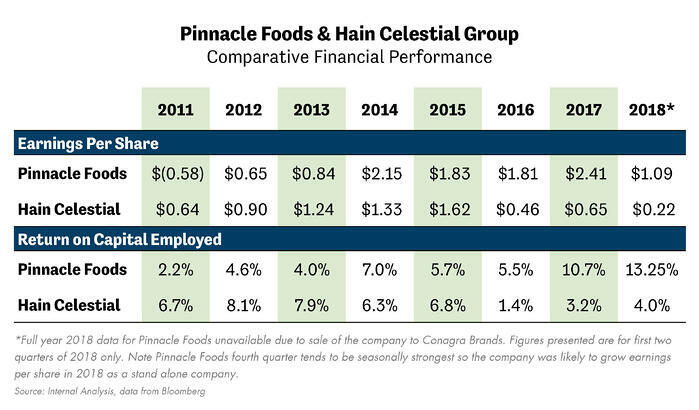 The stock price performance of PF was superb for the three years up to its sale to Conagra, especially when compared to HAIN as illustrated below. This was because the financial performance of the two companies was very different. The table below shows that PF’s return on invested capital improved while HAIN’s declined. There are many reasons why this happened. The team that Mr. Schiller and those who came with him to HAIN had the experience of making this improvement happen. Presumably they learned how to do it. As investors, we cannot be experts in every company nor every industry. With respect to each company we look at historical financial performance, business plans and competition as well as try to understand the prospects for that company’s industry. In the case of HAIN, we have studied the company’s poor recent performance and examined Mr. Schiller and his experienced team’s plan for turning the company around. It makes sense to us. In our opinion, the company had devoted resources to too many brands that were not sufficiently profitable. This not only harmed financial performance from the poorly performing brands themselves, but also created dis-economies because of resources wasted trying to manage too large and complex a company. The new team recently articulated how this was going to change at its recent analyst day. Their plan? Make the company leaner and meaner. This should lead to a rising return on capital, which often brings with it a higher valuation multiple. Put that rising multiple on improving earnings per share and HAIN might be a big winner. Our belief in the ability of this team to execute comes from our understanding that the current management was involved with confronting and executing a turn around of similar problems in the past. We were able to look at PF and understand some of its problems. They were fixed and the company was ultimately sold at a significant gain to patient shareholders. Hopefully the same will happen at HAIN. As always, we must consider the downside before we invest should our bullish scenario be wrong or early. As usual, this entails looking at valuation and balance sheet strength. Although at current depressed earnings HAIN does not appear particularly cheap when measured on a Price to Earnings basis, its assets are very cheap. The stock is valued near its lowest Price to Book valuation (1.35x) in the past decade, down almost 75% from its peak. Keep in mind that those same assets were able to generate $1.75 of earnings just a few years ago. If those earnings were achieved in the future its current price would be a very low multiple for a packaged foods company. The valuation and earnings potential lead to a very interesting risk/ reward scenario. If the company can return to its previous $1.75 in earnings and trade at its old high PE multiple, the share price would be $75/share. That’s a lot of upside from today’s $22/share, $53/share in fact ($75-$22=$53). We think of the likely downside as the stock trading at historic lows of 1x on a Price/Book basis. The stock hit that low valuation only briefly in 2008 and 2018. If repeated, that would take the shares down 25% to about $16.50 per share ($22.40-$16.50=$5.60/share). So, these assumptions yield potential gains of $53/share with potential downside losses of $5.60/share, which drives a ratio of upside/downside of 9.5:1. We think a ratio of 3:1 or higher is good. A ratio of nearly 10x is extremely good. Hence our enthusiasm for the shares. Investing is about taking risk, just like mountain climbing. Although perhaps not as dangerous as that sport, risking money that was earned through a lifetime of hard work is a very serious matter. We have a lot of experience investing. That experience has taught us to try to understand all the risks with every investment we make in order to avoid or mitigate all the downside we can. Alex Honnold did the same in trying to limit the possibility of falling off that mountain. In investing there are often too many unknowns for us to understand. But, choosing experienced managers and simple math such as above, we may still have a reasonable basis to decide in an uncertain world. As investors, our situation is like hiring someone to climb El Capitan for us. We cannot operate the companies ourselves. 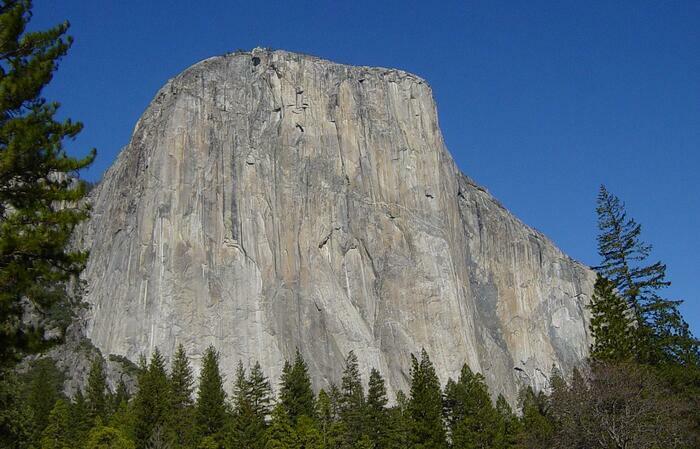 Just as for scaling El Capitan we would first look for someone with success and experience climbing cliffs. As investors we look for management teams with experience and success running the businesses in which we invest. We believe that HAIN’s new team may be such a management team. Based on their past success, we think HAIN may be a compelling investment.